Okay, maybe not the best pick-up line, but if the nose fits…This is another strange insect I found this week, a Scorpionfly, (Panorpa sp.). One morning I found two females out back in a small patch of ferns and False Nettles. They were perched atop some leaves and, in what is typical behavior, would allow me close enough to get one or two pictures before flying several inches away to perch on another leaf. Unfortunately, there were no males present, as it is the unusual “tail” of the male that gives the insect its name. The male’s abdomen ends in a coiled appendage that resembles a scorpion’s stinger. It contains his genitalia and a notal organ, which helps him hold the female’s wings during mating. The tip of a female’s abdomen is just slightly up-curved. 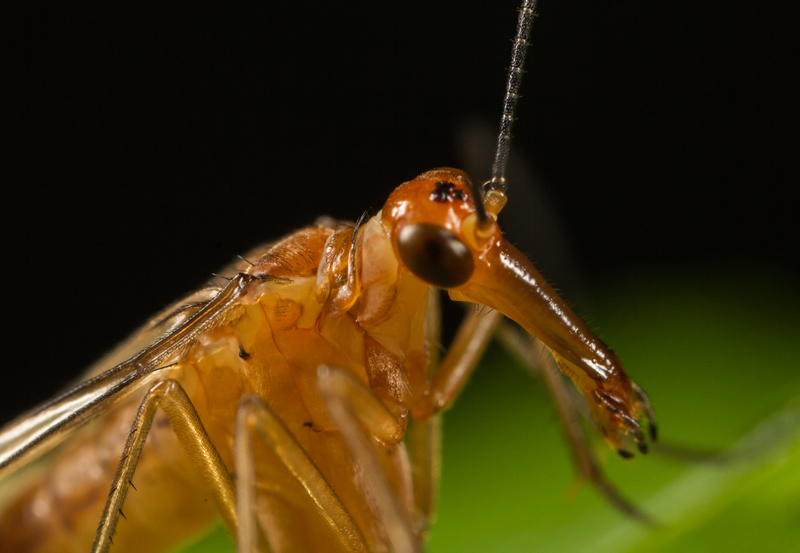 The other unusual anatomical trait of this insect group is the elongated “nose” or rostrum. The mouth parts are located at the tip. Scorpionflies feed on dead insects, nectar, decaying organic matter, and the occasional slow-moving live prey. As if being odd-looking at both ends isn’t enough, these insects also exhibit some extraordinary mating behavior. 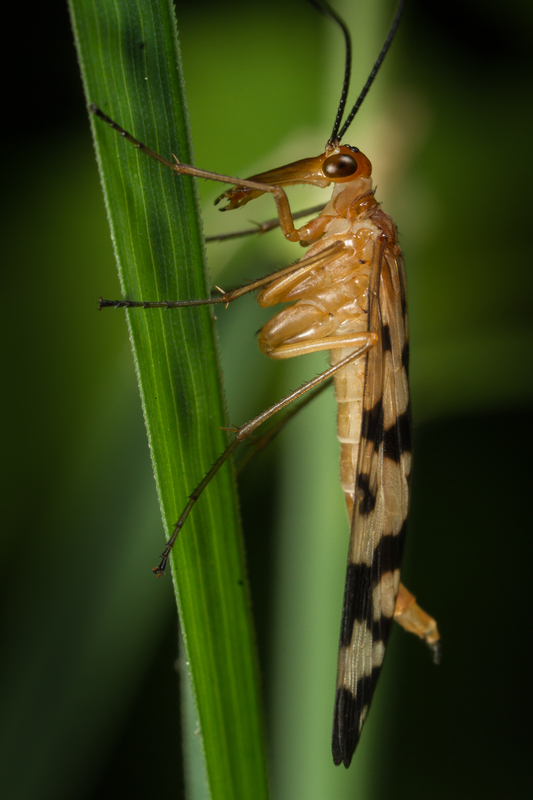 Unlike most insects, it s the male Scorpionfly which may release reproductive pheromones to attract a mate. He then offers her a nuptial gift consisting of a dead insect or, often, a glob of spit that hardens as it dries. If she accepts, he grabs her with special claw-like structures in that scorpion-like appendage and mates while she is feeding. Who needs a pick-up line? 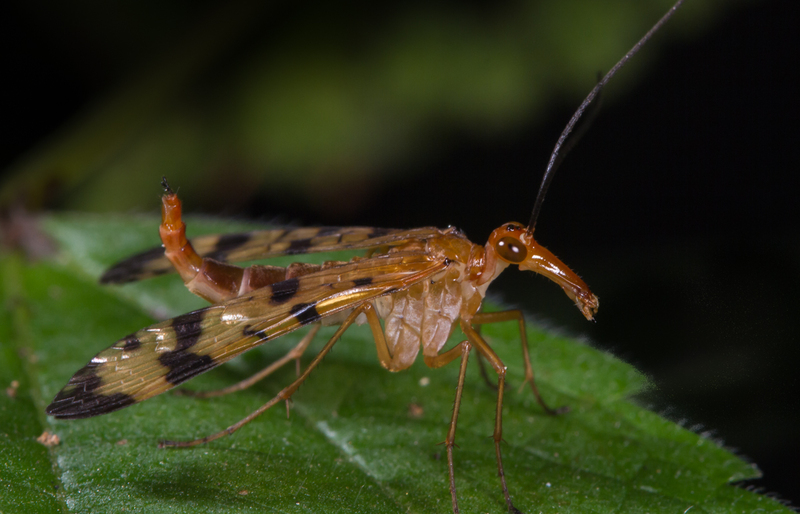 This entry was posted in Natural History and tagged nuptial gift, panorpa, scorpionfly by roadsendnaturalist. Bookmark the permalink.